The bill proposed by Sens. Bernie Sanders, I-Vt., Mike Lee, R-Utah, and Chris Murphy, D-Conn., would require President Trump to withdraw U.S. troops in or affecting Yemen within 30 days. The measure would not affect troops fighting al Qaeda in Yemen. The Senate previously voted to table the measure in March by a vote of 55 to 44. Trump ally Republican Sen. Lindsey Graham spoke in Russell basement following his vote in support of advancing the resolution to the floor. Graham said he did so because he was “pissed” even though he generally supports the war in Yemen. “The way the administration has handled the Saudi Arabia event is just not acceptable,” Graham told reporters. To be clear, this resolution will not result in a withdrawal of military support for Saudi Arabia, mostly because it would never be signed by the President if it reached his desk. But it’s very significant that the anger over Khashoggi’s murder motivated a relatively large contingent of Republican Senators to vote for this resolution along with all Senate Democrats. With every investigation including that of America’s own Central Intelligence Agency concluding that Saudi Crown Prince Mohammed bin Salman personally ordered Khashoggi’s execution, Trump’s refusal to acknowledge this reality is a compounding international embarrassment. If that’s not the perfect Cory Gardner duplicitous response, we don’t know what is! The vote he cast just after taking both sides of the issue in the course of a single sentence is less ambiguous, but you’ve got to almost admire Gardner’s vacuous wordplay. He could convey more relevant information by saying nothing at all. 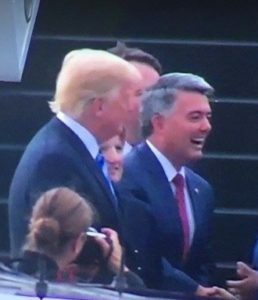 That’s just how Cory Gardner rolls, folks. Certain events make it stand out in sharp relief. The voters will not give a damn about this in October 2020. The Dimocrats need to focus on Cory's desire to cut Social Security and Medicare. This is a distraction. Every President has sucked up to the camel jockeys because we are addicted to oil. I agree voters may not care about the specifics of this vote by the time they get ballots in 2020. Two years is a long time in politics. However, this measure will be one of a pattern of votes noted in the campaign. When even Lindsay Graham objects to a Trump Administration move, it is significant. On a vote of a measure that would not have a practical effect, Gardner refuses to move out of his agreement with the President in order to be on the winning side of a bipartisan Senate vote. Depends on how violent it gets internationally in the next year. There is a lot of ruthlessness going on right now around the world. Gardner can't go out to the mail box without giving careful thought to the benefits of not going. What a dweb.